Bangladesh, a densely populated country of 165 million, is among the world’s “potential impact hotspots” threatened by “extreme river floods” due to the global rise in temperatures. Since the beginning of August, monsoon rains across the entire country and upstream areas in India and Nepal gradually led to severe flooding. Even for communities in Bangladesh that are accustomed to the impact of floods, 2017 was a catastrophic year. According to available data from the Department of Disaster Management (DDM), 6.9 million people from 15 districts have been affected. At the onset of this disaster, South Asia was experiencing much greater destruction and loss of lives than the wrath brought upon by Hurricanes Harvey and Irma. The story was easily overlooked and understandably underplayed by the Western media, while some areas in Florida were still without power, abandoned, and drying out. 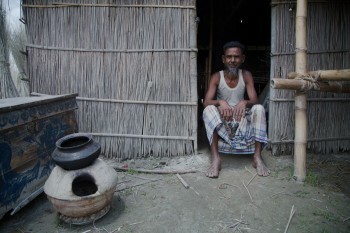 At its peak, a third of Bangladesh was flooded. Even though water-levels in Northern districts have almost receded, the monsoon flood has left great devastation in highly poverty stricken areas. It continues to affect food security, housing & infrastructure, and income generating activities. But, the critical issue is that most of the crop of this harvesting season has been damaged, which will affect the livelihood of the affected population. According to reports, the poor and ultra-poor families have no food to eat. Yet, this continues to remain a “silent disaster” and the affected people are completely forgotten. This was the second flooding event to affect these districts in the current year. It has caused different extents of damages on crops production, as well as livestock. Over 650,000 hectares of standing crops have been damaged; the worst-affected crops are paddy (summer rice), jute (vegetable fiber), dhaincha (multipurpose legume) and vegetables. Aman seeds have already been washed away by the flood water in most of the areas and the damage is irreparable. Therefore, the key challenge is to catch up to this planting season as well as the next harvest for others crops. In addition, damages to fishing infrastructure and fish culture are expected to be high as well as washout, which may badly impact on the livelihood of fishermen and fish related industries. It has also been reported that livestock and poultry are suffering from disease, and the price of fodder has increased. The dominant livelihood activity in the affected rural area is subsistence farming, and also casual labor, around 65 percent households depend on agriculture, while roughly 27 percent households depend on agricultural labor (i.e. low valued daily wage labor). Torrential rains have caused significant damage to household food stocks (rice, pulse, wheat etc. ), with flood-affected people reportedly surviving on limited stocks of dry foods and puffed rice. Recently, Prime Minister Sheikh Hasina extolled Bangladesh’s ability to feed itself in her UN General Assembly address — for the last six years, the country has produced enough rice to be self-sufficient. However, Bangladesh’s rice reserves hit a low this year following the two rounds of flooding, forcing the government to open initiatives to import for the first time in six years. Normally the world’s fourth biggest rice producer, Bangladesh, has therefore become a major importer this year after floods hit its crops, sending domestic rice prices to record highs. The import duty on rice was also revised down to 2 percent from 26 percent, but the price of rice soared back up. High demand from Bangladesh can further lift Asian rice prices, which hit multi-year highs in recent months after South Asian countries witnessed their worst monsoon floods in years. Nationally, government data, which is often lower than market prices, shows an 18 percent rise in a month and 50 percent in a year. Damaged crops and disrupted supply chains have also seen the price of other food commodities, like onions, double in Dhaka’s markets. The lean period in some parts of the flooded region is intensifying food security concerns and prices of rice staples may increase further. “Floods are a normal scenario in this area, but in the last five years, I have never seen any early warnings or a shelter facility in this char (river island). People have to move to another char if they want to stay at a shelter centre, but we wanted to stay in our home and hold onto the little belongings that we have till our last breath. If you want to help us, please don’t just come with a bag of rice because it will only last for a month. What will we do after that?”. Many people, like Ali, are being forced to adopt negative and exploitive coping mechanisms, such as skipping meals, reducing meal sizes and not taking preferred or nutritious food. More than 30 percent of households in the affected areas are experiencing poor and borderline food consumption, compared with 15 percent nationally. In addition to accessing food, there are limitations related to food diversity with serious implications for the nutrition status of affected families. Diminished food stocks and purchasing power is exacerbating a food crisis. 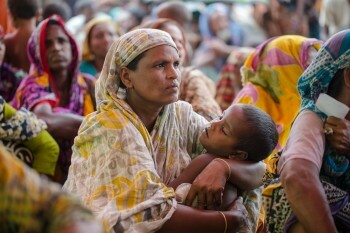 A potential food crisis, along with the sheer number of displaced people, would be a monumental challenge for any government, but in Bangladesh, where as many as 520,000 undocumented Myanmar nationals (Rohingya) have been fleeing violence in the bordering Rakhine state of Myanmar and entering the country since August 25, the situation becomes additionally perilous. Immediate emergency relief was provided most development partners, but the need for long-term recovery of these flood-affected communities have been sidelined. Raising funds has been difficult. International attention is focused on hurricanes hitting the Caribbean and the United States. On top of that, two separate emergencies in Bangladesh means that resources, personnel, and funding are being diverted from the flood response in the North to address the growing humanitarian crisis in the South. Monsoon floods are getting very little attention today, even though there is an urgent need to ensure that targeted humanitarian assistance continues to be delivered in affected areas. Appeals by international organisations have raised only 20 to 40 percent of the requested funding amount. The primary challenge is that slow-onset emergencies, like the one we are dealing with in the North, do not attract enough attention because they tend to creep up on us. However, we must not forget that these types of disasters undermine the resilience of people and production systems, thereby increasing their vulnerability with each new hit. Unfortunately, there is also little or no public interest in contributing to efforts that might help a community be better prepared for a future disaster. As humanitarian actors, we need to make sure that the so-called ‘silent disasters’ are not overshadowed by the big crises that are happening somewhere else in the world. Yes, the newly arrived Rohingya population in Bangladesh need assistance — but flood affected people in the North, far away from the spotlight, deserve the same. Natural and man-made disasters can fully overtake the world’s attention, be completely ignored, or never make it onto the radar of people’s conscience. However, the one universal truth is that, ultimately, everyone is suffering. We do not need competition among different crises; what we need is an “equitable approach” to ensure that all crises are given due attention. Blog by Tessa Schmelzer, Country Representative of ACT member ICCO Cooperation in Bangladesh, and Raisa Chowdhury, Senior Regional Communications & Marketing Manager for ICCO Cooperation — South and Central Asia.